Love our wines and would like the convenience of a bi-annual delivery? The Elderton Wine Vault Club is designed for Eldertonians and other wine enthusiasts to enjoy effortless access to our wines and information. With two options the Wine Vault Club offers flexibility and choice. Twice a year (May and October) a case of wine will be automatically delivered to your door, with the option to ‘opt’ out of that particular case up to three (3) days after notification of pack contents. Members also receive 10% discount on all dozen orders (excluding specials, Elite Single Vineyard Wines and museum wines) over and above Wine Vault Club packs. Download the Wine Vault Club ‘join now’ form, Direct Debit Request Form and Elderton Wine Vault Club Terms & Conditions. For further information, please contact Cellar Door. What are the real benefits of being an Elderton Wine Vault Club Member? Not only do you receive effortless delivery of Elderton Wines directly to your door twice a year being a Wine Vault Club member entitles you to 10% discount on all dozen orders (excluding specials, Elite Single Vineyard wines and museum wines) over and above Wine Vault Club packs. You are guaranteed value for money with some special treats along the way, as well as access to firsthand knowledge from the Elderton Wines team. Can I switch between membership packs, add on or order extra packs of wine? Yes, you are able to switch between membership types, order extra packs and add other wine if stock availability allows. We do process payments before despatch of the packs so please ensure to inform us via email elderton@eldertonwines.com.au or phone 08 8568 7878 prior. The wines are selected by our expert team just prior to each mail out. A list of these wines will be emailed to you before despatch and process of payment so you have the opportunity to ‘opt’ out of that shipment if you wish. Elderton Wine Vault Club packs are pre-selected therefore we cannot facilitate any specific requests of style or vintage. You can however add any of your favourites, with an additional wine order. We have two despatches of a case of wine per year. Once in May and once in October. You will receive email notification of what is included in the pack, and that payment is about to be processed prior to despatch. If you will be away during the time of shipping, you can re-route your shipment to an address that will be able to receive it on your behalf. Simply call the winery 08 8568 7878 or email elderton@eldertonwines.com.au. You will be able to track your shipment with a notification on your email through Australia Post. Can I leave ‘special delivery’ details (ie, leave on front porch)? Yes, you certainly can, just make sure you let us know of the special request and we will add it to your delivery instructions. How do I pay for my bi-annual delivery? On joining the Wine Vault Club you will complete a Direct Debit Request (DDR) for payment via either direct debit from your bank account or credit card only. Your details will be held securely, with St George PayWay System. 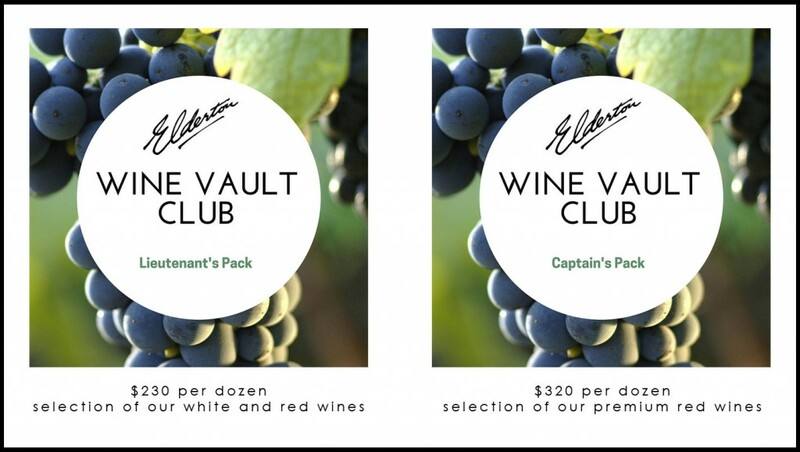 These payment details are for Elderton Wine Vault Club packs only. We accept Visa, MasterCard and American Express. When will my account direct debit/credit card be charged? On the tenth (10th) day of May and October, five (5) days after the email notification of pack contents, and your ‘opt out’ period has passed.